Healthy, quick, and delicious comfort food. Is there anything better? 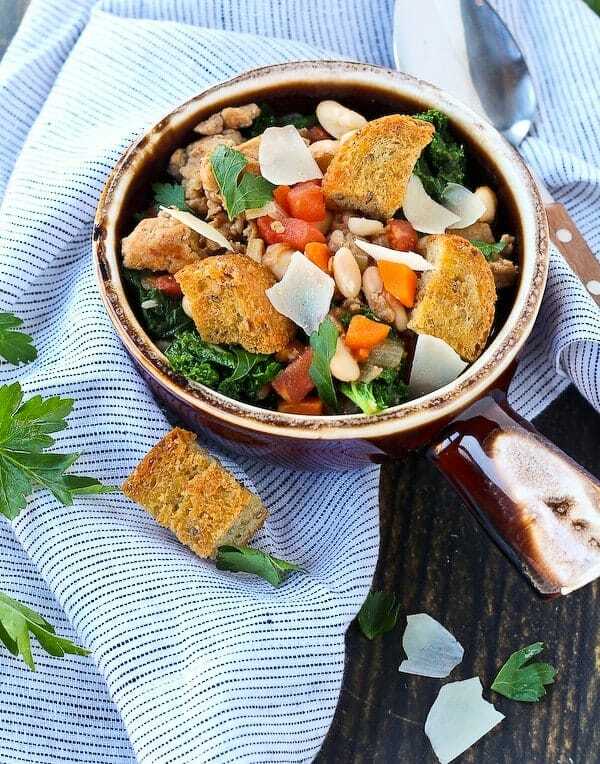 This Italian Sausage Stew with White Beans, Kale, and Homemade Croutons is dinnertime perfection! Major comfort food alert! Bonus, it’s made in under 20 minutes. Depending on what kind of comfort I’m craving, I might not want to be slaving in the kitchen over an elaborate meal. Sometimes I do crave that kind of comfort, the comfort of spending hours in the kitchen, creating amazing food just because I want to. But the comfort I crave most these days is the comfort of a quick, healthy, easy meal after a long, tiring day. Something that doesn’t come from a box or can but will have me out of the kitchen and relaxing with my family, stat. Something that doesn’t make a hundred pans dirty. Something warm, hearty and filling. This recipe fits the bill in every single way. I’m teaming up with Red Gold Tomatoes again to bring you this warm, comforting sausage stew. After visiting their farms and canning facilities, I’ve become more confident of the quality of the tomatoes each time I pick up a can of Red Gold Tomatoes. For this recipe, I used the petite diced tomatoes – I wanted them approximately the same size as the beans, carrots, and sausage. 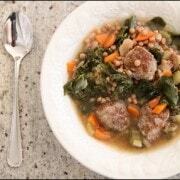 They were the perfect addition to this Italian sausage stew. I’m sitting in the library right now writing this post (I have a couple of rare kid-free hours thanks to my mother-in-law!) and I can’t help but crave this stew. It’s literally calling my name. 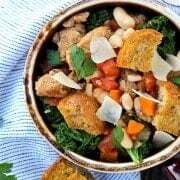 It could be the homemade croutons which are like kryptonite to me, but I think it’s just the combination of the zesty sausage (we use sweet Italian but if you like it hot, go for spicy! 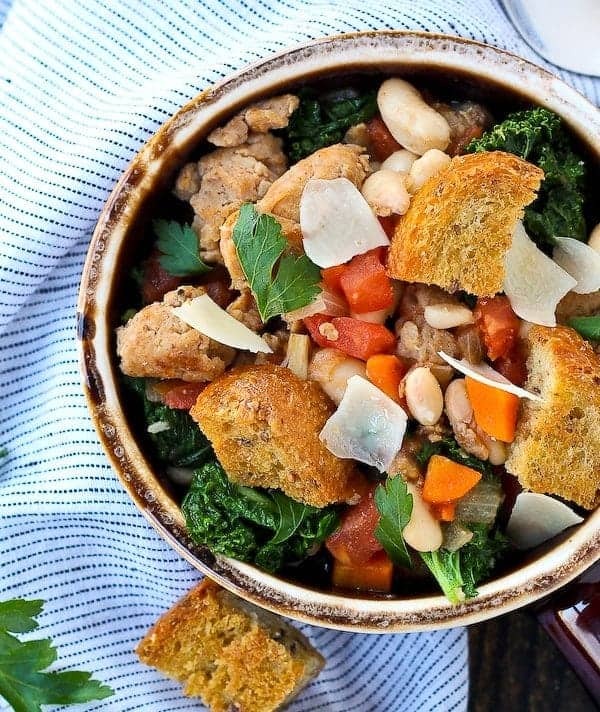 ), the creamy white beans, chewy kale, and sweet tomatoes. Oh and the croutons. Don’t skip the croutons. They soak up a little of the juice in this sausage stew while remaining crispy and perfect. Is it becoming evident that I have a crouton problem? I think our dinner plans for tonight may have just changed. In a large skillet, heat olive oil over medium-high heat. Add onion, carrot, and Italian sausage. Cook, stirring frequently and breaking up sausage, until sausage is browned and cooked through and onions are translucent. Add kale and continue to stir and cook until kale is wilted (1-2 minutes). Add tomatoes, beans, and broth and cook until heated through. If you desire the stew to be more soup-like, add more broth. 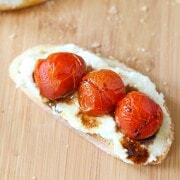 Serve garnished with croutons, fresh parsley and grated Parmesan cheese. Verdict: I’m craving it at 10am at the library. I think that’s a sure sign this one is a winner. Difficulty: Easy, and done in 20 minutes. Actual nutrition may vary depending on how recipe is prepared. 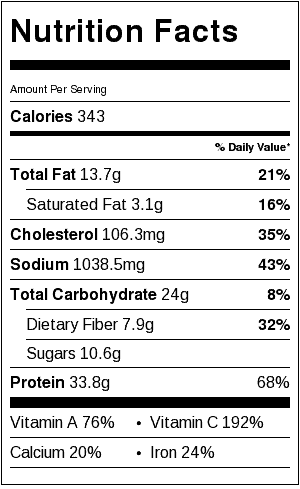 Nutrition information does not include toppings. 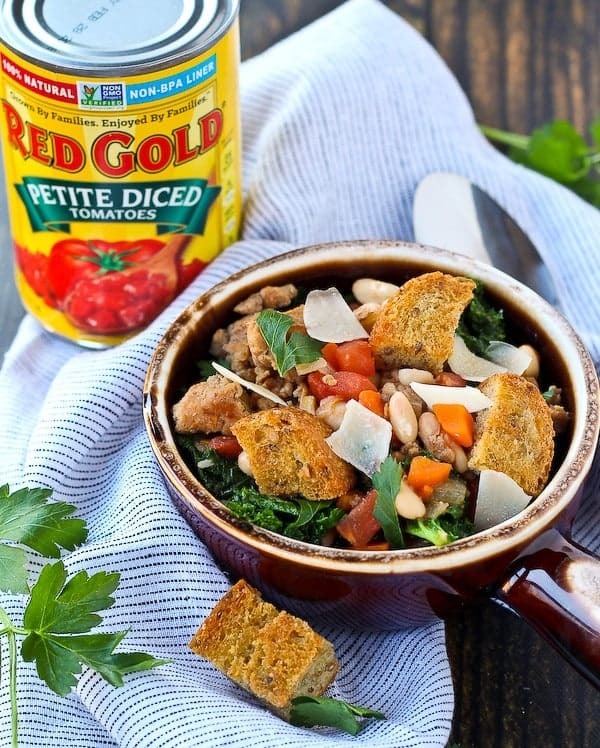 Disclaimer: This Italian Sausage Stew with White Beans and Kale was created in connection with Red Gold Tomatoes. 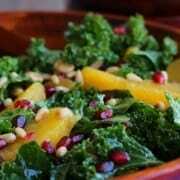 Red Gold compensated me for the time required to create this recipe and share it with you. All opinions are always my own. Thank you for supporting my blog by reading about brands I use and love in my own home. This looks hearty and light all at the same time…which is quite an accomplishment. Looks like a great dinner. I’m all about quick, healthy comfort food. Loving this bowl of goodness Rachel! This looks incredible! A tasty weeknight dinner I know my family will love. Can’t wait to make it! Oh, girl, this looks so healthy and delicious. Great weeknight meal for the family! Definitely making this for my family soon! The perfect dinner for busy weeknights. Thanks Lori! Hope you guys love it. This sounds great! Just perfect for the wonky schedule I have with this infant. I’m loving 20 min meals! Thanks! So perfect with little ones at home.